“Emergency managers” were tasked with fixing local governments in Michigan after the state declared a financial emergency. The decimation of public school districts is nothing new in the world of slash-and-burn education reform, but his candidness is extremely rare. The justification for closing neighborhood public schools while opening publicly subsidized, privately profitable charter schools is constantly changing. Currently, Chicago Public Schools (CPS) is switching between “utilization” and “achievement” as reasons to close 61 public schools, about 10 percent of the district. These reforms will effectively “blow up” and “dismantle” the district without ever using those words. What does Detroit have to do with Chicago Public Schools? Chicago’s current schools CEO, Barbara Byrd-Bennett, worked in the Emergency Manager Office in Detroit from 2009 to 2011. During her tenure, DPS closed 59 schools and cut 30 percent of the workforce. Toward the end of Byrd-Bennett’s tenure in Detroit as “Chief Academic and Accountability officer,” DPS announced its “Renaissance Plan 2012,” which included creating 41 charters, making 29 percent of district run by private interests. That looks like the perfect canvas for “blowing up” and “dismantling” a district. Byrd-Bennett has a history of swooping into a district and leaving it dismantled. When leading the Cleveland Public Schools, Byrd-Bennett cut hundreds of teacher jobs and closed more than 20 schools. Chicago Teachers Union gave community leaders, the media, and clergy an opportunity to see what school closings will look like in Chicago.Byrd-Bennett’s acumen for destabilizing districts caught the eye of The Broad Academy, a billionaire-funded venture that places lawyers and businesspeople into high-profile leadership positions in urban school districts throughout the country. The Academy’s graduates include Byrd-Bennett’s Chicago predecessor Jean-Claude Brizard , Detroit’s Robert Bobb, and CPS newcomer “Chief of Innovation and Incubation Officer” Jack Elsey, who worked with Bobb and Byrd-Bennett in Detroit. If the goal is truly to fix public education in Chicago, would there be a need for marketing lessons for CPS bureaucrats? If during moments of honesty, managers talk about “blowing up” and “dismantling” a district, having a detailed script may be necessary. 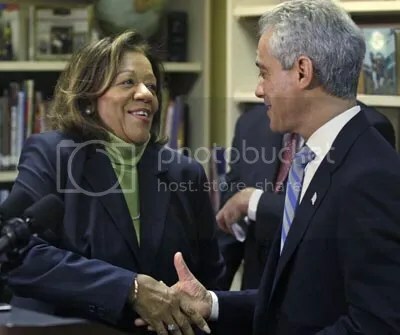 This entry was posted on May 8, 2013 by Kenzo Shibata in Uncategorized and tagged barbara byrd, chicago teachers union, neighborhood public schools, public school districts, rahm emanuel, renaissance plan.